Aussie Bee Online brings you interesting articles and colour photographs, full of news and information about the world of Australian native bees. These are FREE OF CHARGE and are delivered online directly to your computer. Aussie Bee Online: free articles on news, techniques and research about Australian native bees. What’s in Aussie Bee Online? 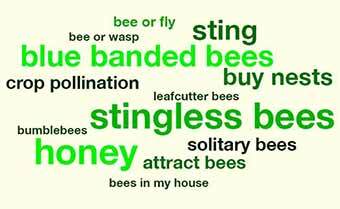 -- projects and surveys of Aussie Bee. 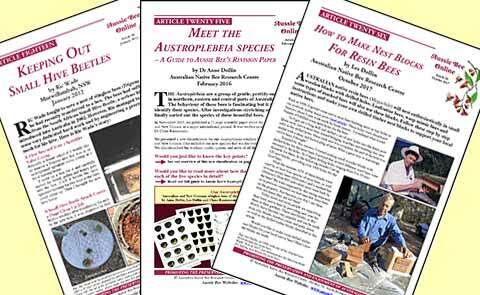 The articles are lively and easy to read, continuing the style of our highly successful Aussie Bee Bulletin hardcopy magazine (1997 - 2001). 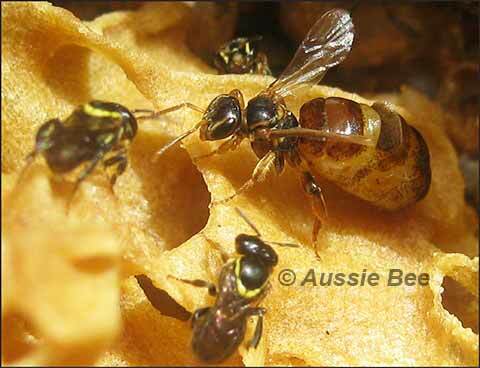 However, as a bonus, the photographs in Aussie Bee Online are in full colour! The discoveries of leading Australian native bee specialists are reported in Aussie Bee Online, including Dr Katja Hogendoorn (University of Adelaide), Melissa Bell (University of Western Sydney), Mark Greco (University of Western Sydney), researchers in Dr Ben Oldroyd's Bee Lab at the University of Sydney, and Anne and Les Dollin (ANBRC). New articles are added periodically as the information becomes available. Dramatic first photos by Anne Dollin (ANBRC) of egg laying in the new Australian stingless bee species, Austroplebeia cincta -- presented in Aussie Bee Online article 23. Click here for full download instructions. Each article is offered, where possible, as both a normal webpage (HTML format) and a downloadable PDF. PDF files provide the free articles in a compact, attractive layout. The photographs in the PDF files are also provided at much higher resolution than those in the HTML versions. PDF files can be read by both Windows and Macintosh computers. Most of our PDF files are only 200 to 500K in size and are quick to download. However, you may need a copy of Adobe Reader to read PDF files. We also provide an HTML version of each article, where possible, in case you are in a situation where you cannot easily download a PDF (such as if you are using a computer in a public library). You may also like to use the HTML version to take a quick look at each article before you download the PDF version. We invite you to print out copies of these articles and keep them in a ring-backed binder. They will build up, year by year, into a substantial new addition to your native bee library. We have even provided a colourful cover page in PDF format to decorate the front of your binder. You are welcome to print out as many copies as you wish of the Aussie Bee Online cover page and articles to share with your friends. You may also email them to friends or host them on other websites. However, the cover page and all articles must be kept in their full and unaltered version including ANBRC contact details. Click here to preview, download and print out the articles of Aussie Bee Online.